Ship Operators & Naval Architect« 1. Users like It 2. It's truely GHS yet it costs lees. 3. It can do almost anythi™ but bre* coffee. W to water, fuels and chemicals. Sure-Seal offers a wide range of circuit configura- tions and accessories to meet most of your sealed connector needs. Millions in stock - Call today! Inspection Service (APHIS), have important roles to play. State and local agencies, including the numerous port authorities, are important members of the team. The private sector, though, is where maritime security will actually come into being. The active and willing participation of ship owners and opera- tors, masters and crew, and facility operators and employees will be the meat on the bones of statutes, regula- tions and guidelines. 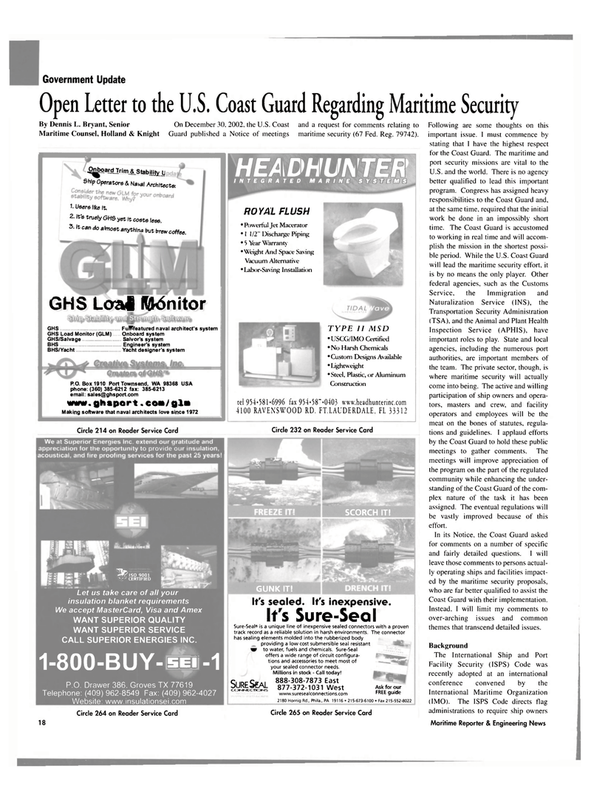 I applaud efforts by the Coast Guard to hold these public meetings to gather comments. The meetings will improve appreciation of the program on the part of the regulated community while enhancing the under- standing of the Coast Guard of the com- plex nature of the task it has been assigned. The eventual regulations will be vastly improved because of this effort. Coast Guard with their implementation. Instead, I will limit my comments to over-arching issues and common themes that transcend detailed issues.